Stocks appeared set to snap their winning streak Wednesday as investors digest recent gains and more corporate earnings reports. 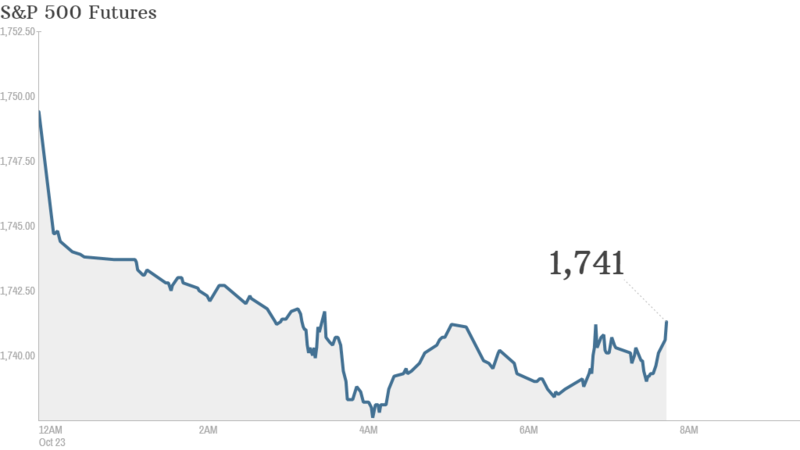 U.S. stock futures were lower, matching a weak performance across most global markets. The pullback comes as major U.S. indexes hover near historically high levels. The S&P 500 hit a fresh record Tuesday after a disappointing jobs report for September fueled expectations that the Federal Reserve will continue to prop up the U.S. economy and delay any tapering of its massive bond-buying program until 2014. All eyes on earnings: Northrop Grumman (NOC) reported earnings and sales above expectations and raised its out look for the year. Boeing (BA) reported a surge in quarterly profit and revenue as the aircraft manufacturer works its way through a backlog of orders. The stock rose in premarket trading. But Caterpillar (CAT) reported a slump in sales and earnings, noting that a slowdown in the mining sector has taken a bite out of heavy equipment manufacturing. The stock dropped. AT&T (T) is scheduled to report after the close. So far, 80 of the 130 S&P 500 companies have beat expectations, according to S&P Capital IQ. But analysts still expect weakness in earnings for the year. Shares of Corning (GLW) rallied after the company announced a $2 billion stock buyback, as well as a partnership with Samsung Display, which manufactures LCD glass in Korea. Netflix (NFLX) shares extended their decline, which started after hedge fund manager Carl Icahn revealed that he had reduced his stake in the company. European markets were lower in afternoon trading, while Asian markets ended firmly in the red. Japan's Nikkei index slumped 2% as a stronger yen hurt exporters, and stocks in Hong Kong and China closed with heavy losses. Asian markets were dragged down by reports that the leading banks in China had tripled the volume of bad loans they wrote off in the first half of the year, according to Marc Chandler, strategist for Brown Brothers Harriman.